Skyleon wrote: Breath of fresh air for me. I'm still hoping for those secondary Dark, Psychic and Fighting types. How about Chespin being Dark, Fennekin being Psychic and Froakie being Fighting? That would make things interesting. Bug types would destroy Chespin, of course depending on its stats. Either one of them would be nice, as long as they have those types. In other news, I for one want nothing more than a half-decent starter final evolution. Now, I'm normally nobody to criticize the 5th gen, but I just downright don't like them. Maybe as Pokemon I can like them, but as Pokemon in battles, I just can't. In fact, as soon I could, I put my starter in the PC box. So, yeah. Also, no Fire/Fighting. Not like they could turn that little ol' fox creature into a part fighting type... Right? Right!? RIIIGHT!? AAAAAAAAGH! There's going to be another goddamn Fire/Fighting type, isn't there!? PLEASE DEAR GOD GIVE ME DEATH BEFORE YOU DO SUCH A THING! DO NOT MAKE THAT FVCKING FOX A FIRE/FIGHTING TYPE! ANYTHING BUT THAT! Game Freak, don't do this to me. Trinitrotoluene wrote: Hey guys. I hate to burst your bubble, but everything Mr. XY posted was fake. Carry on. I personally dislike this form and the whatnot, and then there is the fact that the second image looks so bad. The poster doesn't get to the top, the ink starts to run out, aaannnd it's wrinkled. HOWEVER, SHOULD IT BE TRUE, my guess is that it isn't said Pokemon isn't a new form, but rather a new Pokemon in itself. Notice the amber/red eyes vs. the purple eyes? USUALLY, the eyes are the same color between forms. When there are exceptions, the eyes usually match something else. Such as Rotom's form's eyes matching their plasma(?) outline. Or Meloetta and its hair. The only exception to both these things I see is Darmanitan. So yeah, I'm done. OH BUT WAIT I'M NOT. Look at the space under said Pokemon this post was mostly about. HMM I WONDER WHY THOSE SPACES ARE THERE. 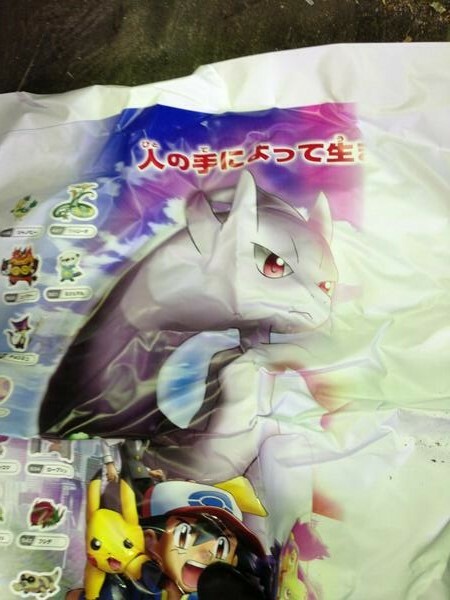 New Mewtwo forme was just confirmed as a fake (bad photoshopping job, the actual poster can be seen here). Sad thing is, I kinda was looking forward to a new Mewtwo form. It looked somewhat interesting and would've made a good story. Still, dem spaces under Mewtwo in that site. So, new Mewtwo form. Just saying. Yep, just saw it, it's confirmed. This Mewtwo form is really starting to confuse me...first it was confirmed as fake and now it was confirmed to be real? And why would there be a new form of Mewtwo anyway? Edit: From what I've read, that Pokemon has been confirmed to be real but not confirmed to be a new form of Mewtwo. Yeah, I just looked again, apparently it's confirmed to be a new Pokemon with a "familiar look." Does anyone else think it might be the long-awaited/speculated/requested Mewthree? Well, if I remember correctly, they called Kyurem-B/W a "new Pokemon," so it could be them just messing with us at this point. CoroCoro just confirmed the new Pokemon as Mewtwo. Apparently after Mewtwo's long sleep, it has awaken with a new form. Apparently the goat is called Gogoat (grass type) and can be ridden outside of battle. 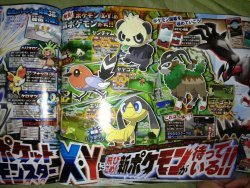 The bird is called Yayakoma (normal/flying type), the panda is Yancham (fighting type) and the other one is called Elikiteru (electric/normal type). Gogoat can learn Horn Leech. 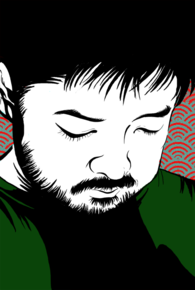 Elikiteru can learn a move called Parabola Charge, which is an energy-draining move. Yayakoma can learn Nitro Charge (that became Flame Charge, right?). Yancham learns a move called Parting Remark. Goddammit, Octillery. Why would you not detail Parting Remark? Yeah, uh, "It has a new move called Parting Remark which lowers its opponent's stats and then forces the user to retreat." Prediction: VOLTURN COMBINATIONS GET A NEW FRIEND. I didn't notice it when I posted. The information has been going up slowly, so it might not have even been there. And VoltTurn will be greatly improved by that. Yay. VoltTurn gets more perks. Also, did anyone notice how you can actually customize the player characters? And robins! And Mawile looking salamanders! And grass goats! And pandas! PANDAS! IT'S LIKE A HOLY GRAIL AMONG POKEMON. in other words i actually like them. and WOOOAHOHOHOHO FAIRY TYPE SPECULATION. ALL ABOOOARD. Thank you so much for that. I knew they looked familiar, but I couldn't remember what. And the customization thing is going to be awesome. I don't particularly like the player characters from B/W, so hopefully some of that can be avoided. "The next batch of CoroCoro information has been released and this batch showcases more information on the upcoming movie, Extremespeed Genesect: Mewtwo Awakens. 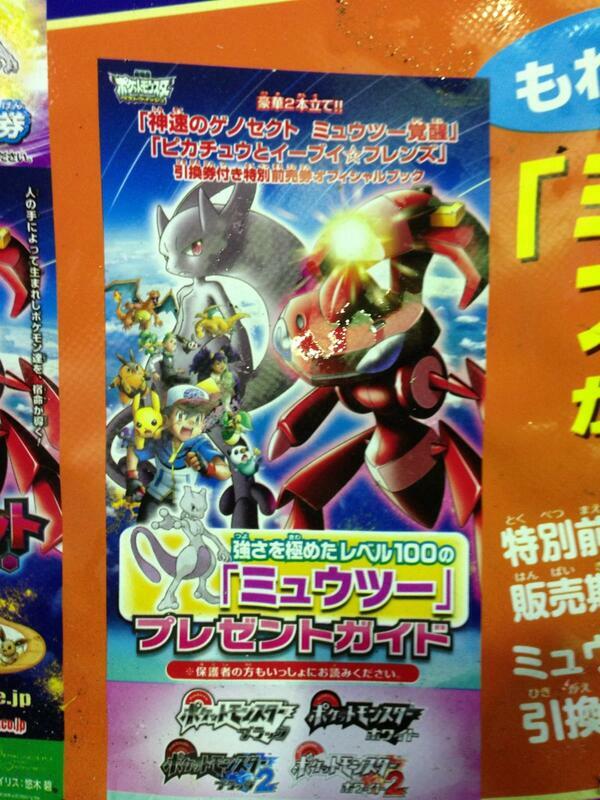 It confirms that the main movie distribution is to be a shiny Genesect with Extrem(e, Serebii. You forgot the e.)speed, Blaze Kick and Shift Gear and holds the Choice Scarf." Shift Gear/ExtremeSpeed/Blaze Kick Genesect, how do you think it will affect how it plays in Ubers? Of course, it won't be all in one set in competitive I don't imagine, except maybe to have more XTREEM SP33D than Arceus. So Gogoat is still Gogoat. These games are going to be good.